There are several things that most people don’t know about the graceful span and all the ways to experience the Golden Gate Bridge. San Francisco’s Golden Gate Bridge is one of the most famous, photographed and beloved landmarks in the world. Yet as popular as it is, there are several things that most people don’t know about the graceful span and all the ways to experience it. Going under the bridge allows visitors to appreciate its immensity and brilliant architecture. Walkers can pause under the span at Fort Point. Blue & Gold Fleet’s San Francisco Cruise Adventure sails under the bridge from Fisherman’s Wharf, as does Red and White Fleet’s Bridge2Bridge Cruise. City Kayak has a Golden Gate Bridge Trip from Crissy Field for advanced sea kayakers. Hornblower Cruises & Events showcases stupendous views of the bridge. Adventure Cat takes swift sailing catamarans under the bridge and around the bay. Also check out the Events calendar on Tideline Water Taxi's website for their Golden Gate Bridge Float Cruise which departs from Sam's Anchor Cafe in Tiburon. Note to editors: Press releases and other media resources are available at http://www.sanfrancisco.travel/media. The San Francisco Travel Photo Video Library is available at http://barberstock.com/sanfranciscotravel. 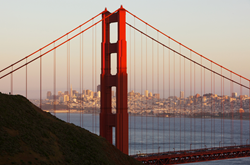 Sign up for e-newsletters on San Francisco travel, culinary or LGBT news.